This Magical Water Will Keep Your Body And Skin Happy! Rice water in simple words is the water which left after cooking rice, starch in other words. According to skin specialists, rice water is rich in minerals and vitamins, making it a magical beauty agent. We all know that rice is a staple for most Asian countries. All you have to do is cook it with some extra water this time. This magical ingredient has several benefits and here is a list of them all. Boil three tablespoons of rice in two cups of water. Allow it to boil for 20-30 minutes. Do not add salt or butter to it. When the water starts to turn milky white, strain it, allow it to cool and drink it. Some people prefer soaking the rice in water for 30 minutes. Add some rice water to your bath and soak your body in it for a couple of minutes. It is a good therapy to relax your mind and body. The carbs present in rice are a major source of energy. By drinking rice water before starting your day, you will have an energetic morning as it will keep you charged throughout. When your days are humid and hot, a glass of this magical water is what you need to keep you cool. 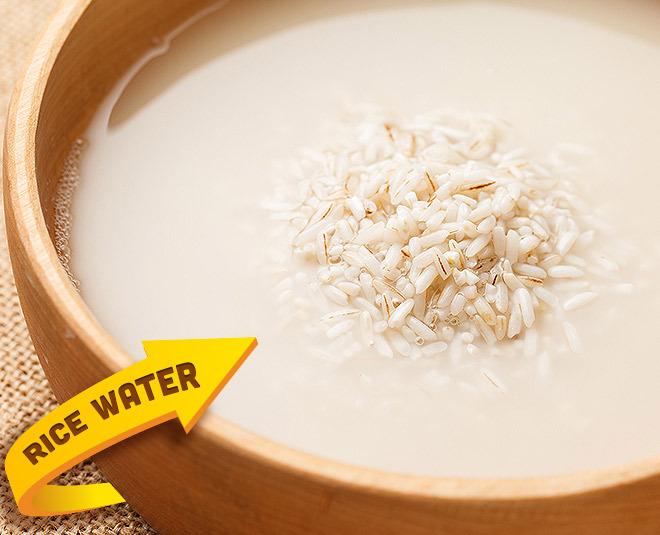 Rice water provides your body with all the essential nutrients it needs to function efficiently. Rice water is the best for both adults and infants. While infants are more prone to diarrhoea, elders with a weak system too face this issue. All you have to do is have a glass of rice water as it reduces the volume and frequency of stool. An important Korean skincare step, rice water is rich in vitamin B and has a component called ‘inositol’ that helps promote cell growth. It also smoothens the blood flow, which in turn helps in clearing the skin. Since this water removes dead cells, it becomes an excellent source for softening your skin. Drop those shelf toners now and make your own version in the form of rice water. It will not just smoothen but will also give a glow to your face. Use a cotton ball to apply the rice water to the area where there is acne. The regular use of rice water reduces the redness and marks too. The cheapest and most organic ingredient, rice water is magical for lightening your skin. Apply rice water 15 minutes before going to bed at night. Do this regularly for 1 month and see the difference. Rice water is effective for burnt skin. Gentle application of rice water twice a day is advisable in minor cases. According to studies, the inositol in rice water is effective in improving surface friction, damaged cells, and hair elasticity.